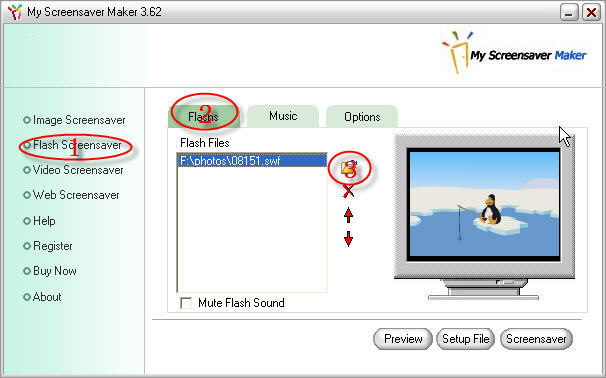 Only by collect your favorite flash file you can create and share your flash screensaver. 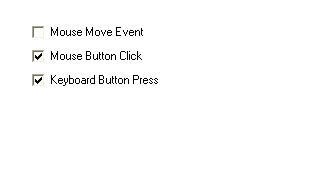 Click the "Flsh Screensaver" button (marked with "1") in the left of the windows in the picture above,set the Flash tab actived by clicking the "Flash" tab head ,marked with "2" in the picture. 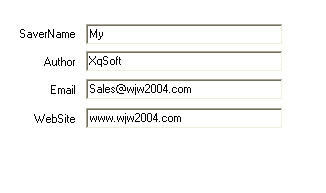 Click the "Add flash " button (marked with "3" in the picture) to select and add flash files that you want.You can use the button "up" and "down" to modify the flash's order, if you want to remove flash from the list, please set the flash that you want to remove in the list and the click the button "Remove". 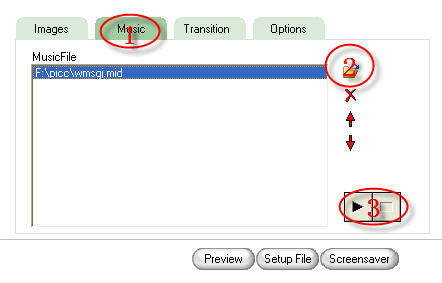 Also you can customize more options in flash screensaver,such as the background music,etc. Flash Size:It is setup the flash display mode. 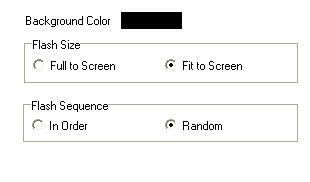 Flash Sequence: Radio button let you choose whether display flash in their normal order or in a random order. Mute Flash Sound: If the flash has sound and you do not need it please set it to be checked.